Anon. Sale, Christie's, London, 4 March 1966, lot 25, as 'Seghers', erroneously described as Christ and the woman of Samaria (16 gns.). D.R. Van Fossen, The Paintings of Aert de Gelder, unpublished thesis, Cambridge (Mass. ), May 1969, no. 103, as Aert de Gelder. W. Sumowski, Gemälde der Rembrandt-Schüler, II, Landau/Pfalz, 1983, p. 1172, under no. 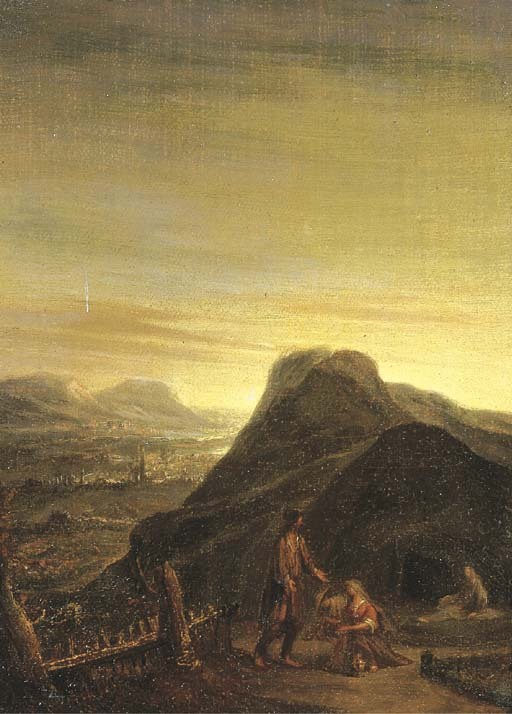 776, as Aert de Gelder. J.W. von Moltke, et al., Arent de Gelder, Dordrecht 1645-1727, Doornspijk, 1994, p. 113, no. D7, fig. 54, under Doubtful Paintings. Leyden, Stedelijk Museum, Rondom Rembrandt, 1968, no. 15. The present lot has traditionally been regarded as a preliminary sketch for the Christ before the two Marys in Aschaffenburg, which belongs to the Passion Series executed at the end of the artist's life. However, this opinion can no longer be sustained. De Gelder did not use oil sketches as prepatory works, but rather expressed himself directly onto the canvas. That this is also the case in the present lot is shown in the garments of Christ where the artist has removed some paint with the back of his brush, as well as by the different representation of the figure of Christ, which displays a great deal of originality. These are arguments in favour of the attribution here proposed. We are grateful to Drs. Guus Sluiter for his assistance in preparing this catalogue entry.